Dominic Dugo, a career prosecutor with the San Diego County District Attorney’s Office, has prosecuted insurance fraud including workers’ compensation, auto insurance, healthcare/disability, and life insurance fraud for 26 years. In 2010, Llorente Investigations named Mr. Dugo their nationwide Insurance Fraud Prosecutor of the Year. Previously, in 1999, he was named Insurance Fraud Prosecutor of the Year by International Association of Special Investigation Units for Southern California. Mr. Dugo established San Diego’s Premium Fraud (1996) and Medical and Legal Insurance Fraud (2005) Task Forces. Both of these were the first of their kind. 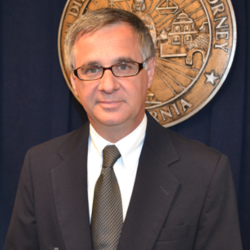 Mr. Dugo has served as Assistant Chief and Chief of San Diego’s Insurance Fraud Division. In 2016, Mr. Dugo was promoted to Chief Deputy. He now oversees the Insurance Fraud, Economic Crimes, and Victim Services Divisions.